The game is played on a 5x5 board. 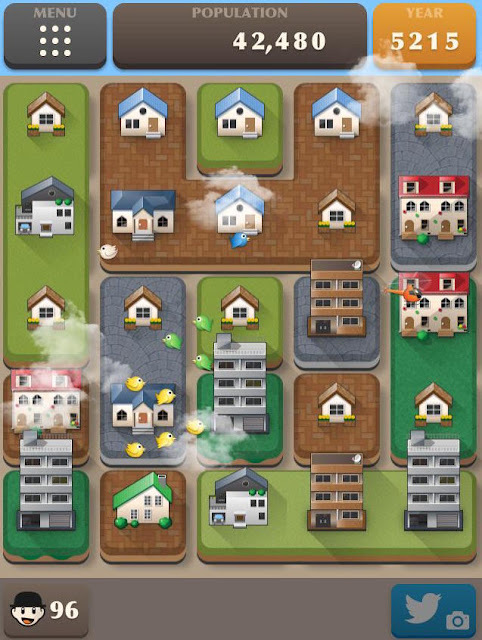 Each tile has a building on top of it (initially of levels from 1 to 9) and it can have one of 4 colors (initially 3, to make the beginning of the game easier). If you have two adjacent tiles of the same color they form a region of that color. Your moves consist of tapping a tile inside a region; the effect is that all the region merges into the single tile you tapped. The new tile will contain a building of higher level than the merged buildings. After that the remaining tiles fall down to take up the available space, and the freed space at the top of the screen is filled by new random tiles. This might cause new regions to form, so the next move will have to merge a new region. You loose when you run out of moves, that is when all tiles are isolated. When you reach a level 10 building then you get a white tower and the color of the tile automatically changes to white. When you have a region of level-10-buildings and merge it, you get a higher than 10 level building. For example, when you merge two level-10-buildings you get the hotel shown above (level 11), and by merging three level-10-buildings you get a Japanese castle (level 12). The more level-10-buildings you merge the more impressive building you get, and the more population your city will have, which is the score. Buildings above level 10 have golden tiles and they are immutable, they do not form regions and do not merge any more... they are the final buildings of your city. In the picture below, you can see the Shangai tower (golden tile) at the bottom left and a level-10-building in the middle. 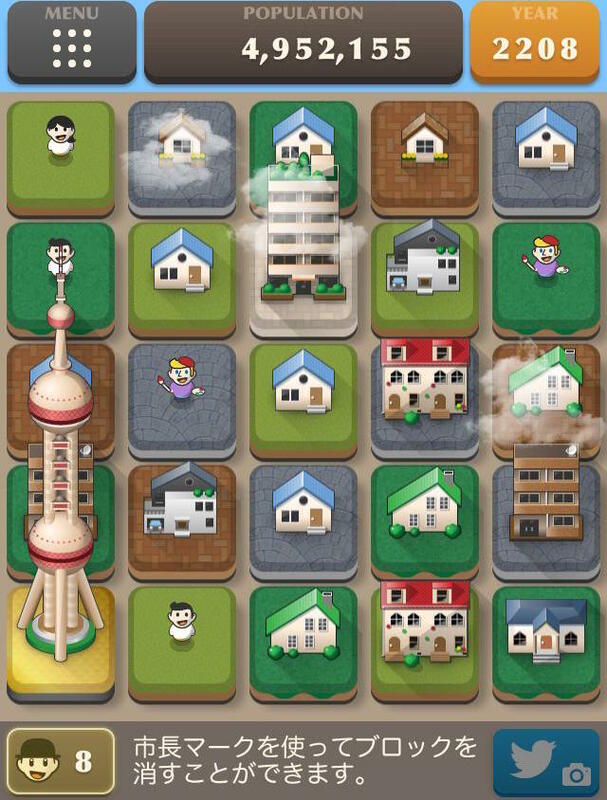 Just one more thing... at any point in the game you are allowed to use mayors (the guy with the bowler hat in the lower-left corner) to destroy isolated tiles. You start with 2 mayors, and for each 100 moves you get an extra mayor. You also get extra mayors when you construct very high level buildings. Mayors are very important because usually you have annoying tiles that can't otherwise be combined in any way. It's very easy to get the hang of the game and start merging and merging into bigger and bigger buildings. Constructing high level buildings is very rewarding, each one has its own character and its a pleasure to discover them. All the rules of the game seem just right and simple to grasp in my opinion. But also the size of the board, the number of colors a tile can take (four), and the amount of randomness built into the game all seem perfect. As Nicola Salmoria describes it, playing feels relaxing. The music is equally relaxing. As he also reported to me: "The fact that you can decide to temporarily lower your score by destroying a gold tile (using a mayor) in order to make a bigger one later is cool. It makes it an 'evolving' game". I do have a few critiques though. First of all, the arithmetic of merging buildings is not clear. If you merge a level 5 building and a level 6 building, what do you get? I have no idea, there must be a rule but even after playing quite a lot I haven't figured it out. You can play without knowing the arithmetic, but it would be very helpful in some situations. The second issue is that when you become proficient in the game the difficulty curve becomes flat. It needs some expertise, but if you are able to construct high level buildings then you get enough mayors to sustain yourself indefinitely. I think it is useful to think of the game in terms of cycles, each cycle starts when you construct a golden tile and ends with the construction of the next one. So, if you manage to earn more mayors than the ones you use in each cycle, then with patience you can collect lots of them (double figure number of them). With lots of mayors you are able to get very high leveled buildings (by this I mean joining at least 16 level-10-buildings). All this process can take hours. For me its too time consuming. I think that the number of mayors you get for high level buildings should be balanced better, by giving less of them for example. I did write a separate strategy guide with details on how to get very high scores. Finally, I wish there was a leaderboard in GameCenter where players are ranked according to the highest level building they have constructed. It just makes sense to me. There are some players that have managed to merge 24 white tiles (the maximum), and if I am not mistaken, this alone gives you around 250 million in population. Anyway, these are minor things. SubaraCity is a great game and I highly recommend it. It's just a perfect game to distract yourself for a while, but at the same time it gets you highly involved. My thumbs up to the developer Ryuji Kuwaki @torunodev. 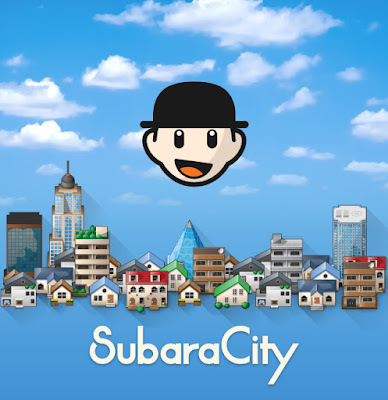 He has been able to do an original and rewarding game in a highly competitive genre, SubaraCity deserves a wider audience in my opinion.